Since we can never escape from the Halos . . . It's not OCD if we can prove it. Sir Blunt sent us a theory along. I've picked out a few bits that really stuck out. I don't think the Halos shoot out a searing plasma wave of death for 25,000 light years in all directions. We know from 343 that we don't need to wipe out all life; just those with a critical biomass and intelligence. With this in mind, what would make more sense is a targeted burst of energy. Now since it's targeted, you need targets. The only thing big enough to target from 25,000 light years away are stars. So, I think that halo shoots out some laser or energy burst that has a frequency in resonance with what ever star it is targeting. I think most stars that can support life are roughly the same so it could probably get by with just one frequency. If you excite something at its resonant frequency you can get a huge response with relatively little energy input. Like an army marching across a bridge. If they march at the right tempo, the wave energy builds up and amplifies and the bridge can collapse from the vibration. You can do this with anything. Everything has a resonant frequency. I'm thinking if this was done to a star it could cause a period of increased solar output or solar flares that would overwhelm even those planets protected by a magnetic field. This would effectively irradiate all life in the system. Intelligent life is rare, so not very many stars would have to be targeted. Assuming the forerunner had complete control over the galaxy with highly advanced slip space and teleportation capabilities, they probably had a good idea of where most, if not all, advanced life was. They may have even recorded all the places life was. Maybe even made an INDEX of all life, and stored it in a LIBRARY. This index would have a list of all intelligent and non intelligent life and their locations. The halo would need this index to target the right stars, so it couldn't fire with out the index. I don't think its that important that there could still be intelligent beings flying around in ships or on space stations. With out a habitable home planet, they would eventually die or be consumed by flood, who would then starve anyway. Its probably just important that the vast majority of consumable life is eliminated. For halo to be effective, the index has to be undated every few millennia, or it has to make assumptions about the non intelligent life evolving over the years. Also, you don't need full galaxy coverage with a targeted system. Since the core of the galaxy is a quagmire of death, radiation, antimatter and unstable orbits, you don't really need halos there or anywhere else there is no intelligent life. So all this halo coverage talk is needless. Given that the rates of evolution are pretty unpredictable, I'd imagine you'd need to update the index more often than every few millenia. Alien abductions, anyone? Now we know why Finn glows at night . . .
Rachda (rachda43@yahoo.com) looks back on the (otherwise fruitless :( ) flash from halo2.com to officially put his finger on the continent the Ark inhabits. Old news, honestly. But with the secure knowledge of the Ark's location, GLuebben (gluebben@hotmail.com) has taken the time to speculate on the Forerunner (or quite possibly Covenant) glyphs and symbols seen so far, which installations they point to, and what they might all mean. You can see his pdf here and speculate in this thread, here. For reference, here is the image "This Is What We Came For" (pointing to Africa) and another image of the galaxy showing the same symbols (taken from the old halo2.com). However, because there are only six markings instead of the eight plus that could be expected (seven installations plus at least one Ark), the overall accuracy of these pictures is questionable. Looks like a scarab. Sounds like a Scarab. What does the Ark have to do with a Scarab? Edwards wonders the same thing. Grantix wonders, given the structure's shape and the hole in the clouds in the Halo 3 trailer, if the Forerunner ship that Truth is on (as though I could be talking of that other Forerunner ship :P ) is meant to dock with the Ark. A neat idea. After all, that ship can apparently generate a lot of power and is teh massive. Frankie also mentions in the Halo 3 Faq that "Halo fans may recognize something about [the Ark's] design". Hmmm... Scarab? Dock for the Forerunner ship? What else? "Q: I also noticed Master Chief's gloves had changed. Does that mean it's Mjolnir Mark VII? A: We haven't revealed that yet . Don't jump to any conclusions." Artistic liberty, or new components swapped in, as the other Spartans did in First Strike? Ocean_fx (kobayashimaru_@hotmail.com) has the notion that the hole in the sky (seen in the Halo 3 trailer) is the result of a Covenant excavation beam (as in First Strike), explaining the exposed Ark. A keen notion, though it does fly in the face of utility. As UrsusArctos says, notice the small size of the Covenant ships compared to the Ark, and therefore how tiny their excavation beams would be; it would take them a month o' Sundays to uncover that thing (and nobody busts out their excavation beam if it's going to get called tiny). More importantly, Regret already produced one gigantic explosion in his Slipspace wake, decimating a rather large city in the process; this is undoubtedly an intentional plot point. In the trailer we see wreckage on the horizon which, it is not a stretch to assume, is the remains of the "space elevator" once anchored in New Mombasa. It also adds a touch of irony to Regret's arrival on Earth, considering just how close he was. The H2 manual mentions that the usual Covenant tactics of bombardment against the Earth cannot be used (due to the nature of what they are looking for), yet Regret (in apparent ignorance) has no qualms about slipping away from low-orbit, all but annihilating the African city. What he wants is not there, or he simply does not know what he is looking for. The Ark on Earth: Voi, Africa? I do believe we know the location [of the Ark] now, thanks to the Halo2 Soundtrack Volume 2 playlist. The Epilogue (Credits) track's second movement is titled "Road to Voi". Voi is a small trade town a short hop from Mombasa. I believe its quite safe to say near there is the location of the Ark. Interesting. Though other considerations might lead us to place the Ark at the site of the late New Mombasa, this is a keen observation. I wonder how it will come into play. "Not with a bang but a whimper..."
The announcement nobody saw coming ( :P ) has arrived. Head over to bungie.net for the full scoop on the new Halo 3 trailer. I know you... your past, your future. "Beware. The mythical Thoth was concerned with maintaining the balance between creation and destruction, yes and no, light and darkness, not the triumph of one over the other." "Oh, and your poet Eliot had it all wrong: THIS is the way the world ends." Sure Jillybean already pointed this thread out, but I thought I would highlight one of the all too interesting sub-posts within it. Yep, time travel gives me The Shivers of the Cliche as much as anyone. But if it was going to happen, this would certainly be one way to got about it. Perhaps from all the data Cortana has downloaded from the Halos, she has figured out how to reliably transport herself through time. Much like how in First Strike she was able to make covenant weapons work much more efficiently; maybe she was able to solve the problems of time travel as well, all she needs is a covenant ship and a crystal. All this data from Halo's control room may have also given her the key to her own sustainability, preventing her demise; in a sense making herself immortal. Cortana, with possibly the help of half jaw or arby, is able to get into the systems of a Covenant ship and take it back in time. Her love of humanity is so strong, that she waits eons for the covenant to find her. When they do find her, they think she is a gift from the Gods, and so begins her attempts to effectively destroy the covenant. Perhaps it was Cortana that prevented the Covenant from being innovative. Maybe she intentionally weakened their technology. Perhaps she created the Covenant's AI to be so weak that she herself can crack them when her younger self comes into contact with them in First Strike. Could it be possible that all of the Covenant's military blunders (albeit only a few) be attributed to Cortana? Could it also be possible that Cortana stalled the covenant's discovery of the Halos until humanity had the technology (slipspace, MAC guns, Spartans) to possibly stand a chance? And now, Cortana could be on the Forerunner ship, and will be able to help the MC out in Halo 3? Well, as eliminating a critical threat goes, she's sure taking the subtle approach. Oni HighCom on Earth connected to the Ark? Dragonclaws certainly thinks so (and with good reason, I say). The humans probably don't know what it is, IF it is, but the fact that ONI has apparently known of the Reach Forerunner installation for an indefinite amount of time should have set off a few more alarms than it did. For the Reach facility to have been built coincidentally over top of those caverns is just that: quite a coincidence. If ONI had some knowledge of Forerunner sites (stemming from an unknown source) it would make sense that their underground facilities would tie into them whenever possible. Don't mind the forum flak; I think you're definitely onto something. The chances that Castle Base "struck Forerunnner" (Black Gold, Texas T...) accidentally is extremely unlikely. And no matter what, that ONI had known of these tunnels since some indefinite point in the past was a massive revelation in and of itself. If Castle had been built atop the caverns unintentionally, you can bet that ONI's been scrounging around for more such locations on other worlds ever since (Coral?). If Castle was strategically positioned on top of the Forerunner relics, this strongly implies that others had been found previously (in a similar fashion/location we might assume) to merit the search and eventual decision to build there. Here's the interview; here's the demo. So, was the Heretic level orginally to be played on Basis rather than the Mining/Lab Facility? 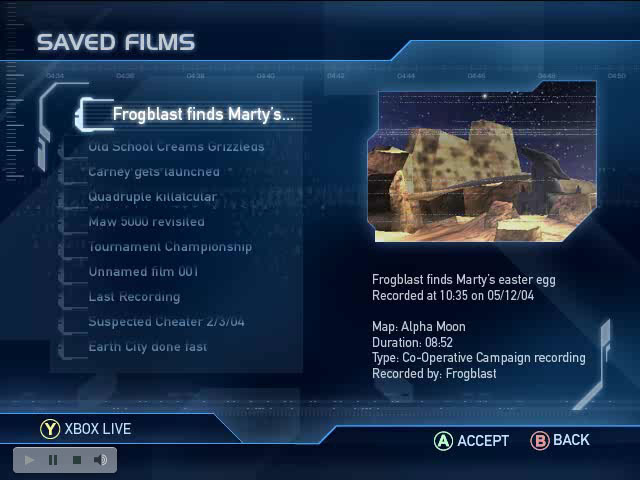 Or is this one of the further levels cut from the game (to be visited by the Arbiter on his way back to Earth for the Ark level)? This at least explains the several mentions of a low gravity level and playing amongst "the ruins of the first Halo", showing the corresponding campaign level for the MP map Burial Mounds.